The miraculous aloe leaf contains 200 compounds, including 20 minerals, 18 amino acids and 12 vitamins. 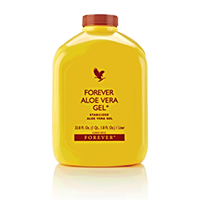 A product of our patented aloe stabilization process, our gel is favored by those looking to maintain a healthy digestive system and a natural energy level. The first to receive certification by the International Aloe Science Council, this rich cocktail of pulp and liquid authenticates this product just as nature intended. Taken daily, either alone or mixed with pure fruit juice, it is one of the best nutritional supplements available!